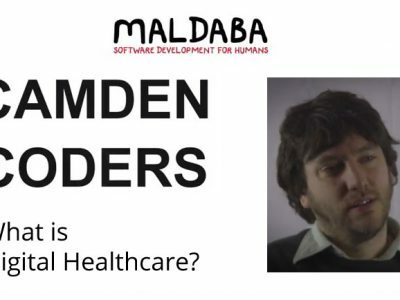 Camden Coders #2 – What is Digital Healthcare – Maldaba Ltd. Since Maldaba’s inception in 2002, we’ve been brought-in to health projects as “the technologists”. We’ve been working with our clients for years to help them see us as integral members of their teams to help shape and design projects, not simply engineers to deliver those projects once the specifications are finalised. Mark’s discussion of “Digital Healthcare” is a good example of Maldaba’s approach and how we challenge assumptions, always putting the issue into a broader context. Watch the video to see Mark’s explanation. If you have a digital project (healthcare or not) you want to discuss with Maldaba, please get in touch.